• May be customized to show off your school spirit! 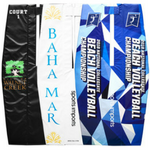 Sports Imports SVP1 Beach Volleyball Pole Safety Pad has a sleek, tapered design that encloses all volleyball poles in a “triangle” of 2″ thick vinyl covered foam. It features four hook and loop straps ensure a smooth consistent closure. The SVP1 is made of a specially treated heavy duty weather resistant vinyl to ensure durability, and water resistant closed cell foam. The pads are ASTM E-84-08a flame retardant (California 117.T.B) and compliant with California Prop 65. PLEASE NOTE: PRICE IS PER PAD. 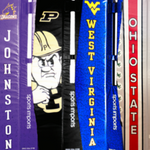 Sports Imports SVP1 Volleyball Pole Safety Pad is weather resistant and has a sleek, tapered design that encloses all volleyball poles in a “triangle” of 2″ thick vinyl covered foam. It features four hook and loop straps ensure a smooth consistent closure. The SVP1 is made of a specially treated heavy duty vinyl to ensure durability, water resistant closed cell foam. 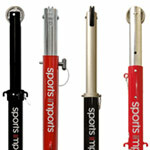 It can be customized with your school name or logo. The pads are ASTM E-84-08a flame retardant (California 117.T.B) and compliant with California Prop 65.